Why do weddings get all the love? Fine china, fancy appliances, honeymoon registries – the list of wedding luxuries goes on and on. Sure, it’s something to celebrate, but so too is the sweat equity, sacrifice and years of work it takes to secure a high school, college or advanced degree. Not to mention, if you’re a parent, the money you have invested in tuition, housing, meals and laundry. Graduation can be a celebration too. The culmination of those years of hard work and dedication is certainly deserving of as much excitement as any wedding, birthday or other major milestone celebration. Plus, like a wedding, a graduation is a milestone when many people are starting a new phase in life…and, well, need stuff to get started. 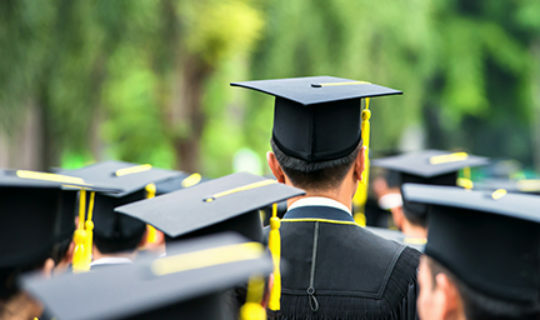 If you’re looking for a fittingly extravagant way to mark the occasion, consider one of these great graduation gift ideas. By the end of college or grad school, the electronics in your new grad’s life have probably undergone a bit of a beating – a few too many falls off the bedside table and a few too many trips to class in a bag alongside leaky lunches. A new laptop or tablet upgrade is the perfect way to kick off life post-grad for both practical reasons, like work, and playful reasons, like streaming the latest season of Game of Thrones. Especially if you’re going into the professional world, you’re going to want something you can count on. Furniture and housewares may not seem like the most exciting gifts, until your new graduate experiences the sticker shock of furnishing his or her own new place. The practicality of a big-ticket purchase like a new bed with a comfortable (non-futon) mattress or a statement living room table is sure to get a lot of appreciation. Just be sure to include your graduate in the process. You want to make sure you’re getting them something they’ll use and love. When it comes time to buy furniture, be sure to comparison shop and negotiate for the best deals. Consider quality as well as cost when shopping. Plus, check out your financing options, like a personal loan, if you want to spread costs out over time. Want your graduate to come home more often? Consider celebrating their big day with the gift of a car. Whether you buy new or used – or fix up a classic – you can research and compare prices online before making your way to the dealership. If you shop at the end of the month, you may be able to score a deal from a salesperson working to meet their monthly sales quota. Just remember to keep the practical needs of your new graduate in mind while browsing potential vehicles, and consider their ability to cover the ongoing costs of maintaining the car you choose. A professional wardrobe does not come cheap. We’re not only talking about designer duds, but clothes for interviews and the occasional networking cocktail party. Building out their work wardrobe may not be cheap, but can help give them a strong, confident start in “the real world.”. For designer clothes, consignment stores and discount retailers offer designer staples on the cheap. And following your grads favorite brands on social media can keep you in the know should any last minute deals or flash sales arise. There are few better times to travel than the gap between graduation and the start of a new career. While many graduates have the time for such adventures, most are missing the funds to be able to afford them, making a bucket list trip a great graduation gift. If you can’t afford to fund a full trip on behalf of your graduate, consider offering them a sum for incidentals like meals and activities, or gifting airline miles to cover the cost of flights, or using a personal loan to pay trip costs over time without relying on higher interest credit debt. Don’t underestimate the value of cold hard cash when considering what to give your freshly minted grad. With student loans to repay and careers still in the making, a post-graduate cash infusion can be a huge relief – covering necessary costs like rent, food and transportation, and even a few extras – happy hours, massages and lattes. Graduation is a time to give the loved ones in your life the credit they deserve. A little bit of extravagance isn’t a bad way to kick off the celebration!